Born in Germany, Canadian resident Eckhart Tolle underwent a spiritual inner transformation at the age of 29 that totally changed his life. He spent many years honing his skills, and today has helped millions of people with his motivational speeches and books such as The Power of Now. Even if you never get the chance to hear him talk live, you can take full advantage of his wisdom on Eckhart TV, his retreats, and his works on CD and DVD. Author, pastor, preacher, and speaker, Peale, was a champion of something we now take for granted – positive thinking. But back in 1932, when he first brought his ideas to the fore, he was, at first, dismissed by the experts of the day. But undeterred he continued with his work, and is now regarded as one of the leaders of the concept that today we all understand can be powerful and life changing. Surprised that the former A Team actor makes it into our top 12 list? Well, you shouldn’t be. Because this much loved action TV and movie star is truly incredible at getting the motivational juices flowing. Australian, Nick Vujicic, certainly had more to overcome than most. Born with an absence of all four limbs, this Christian evangelist struggled through his early life to come to terms with his disability. But at the age of 17 he formed the organization, Life Without Limbs, and is today one of the most powerful motivational speakers there is in the world. 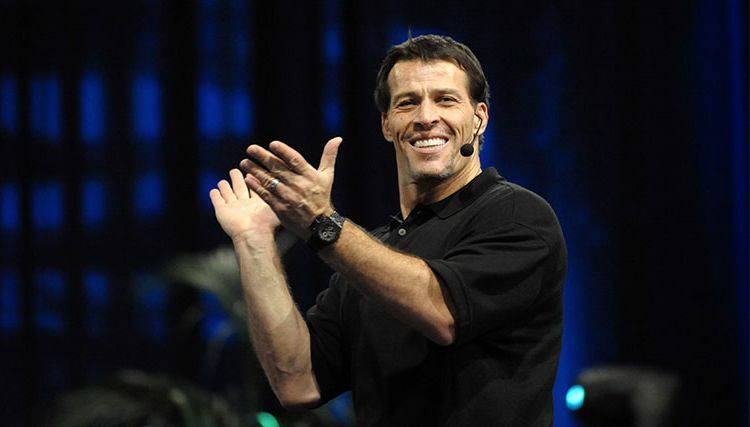 No list of motivational speakers could be complete without Tony Robbins. Author of no less than 6 world bestselling books, he is perhaps one of the leading speakers today in regards to both business and personal success. He’s got a string of accolades longer than your arm, and has been nicknamed the ‘CEO Whisperer’ thanks to how many of the world’s top businessmen look to him for motivation as to how to take their work onto the next level. Recognized by Time Magazine as one of the US’s top 25 most influential Americans, Stephen Covey continued to inspire people around the world right up to his death at the age of 80 in 2012. You can still take advantage of all of this great man’s teachings at The Stephen Covey Community, where his work in motivation and help to all is continued to this day. Financial author, TV personality, motivational speaker, and radio host, Dave Ramsey is primarily focused in helping folks get out of debt. But he also helps people like you and me build their life by understanding and controlling their budget. You can follow his radio show on many US stations, or listen at your own convenience at The Dave Ramsey Show on YouTube. He may not be with us anymore (Ziglar died in 2012), but he’s certainly left an incredible legacy. Perhaps one of the best known motivational and inspirational speakers of all time, Zig Ziglar’s work is continued today in the form of Ziglar Inc.
Perhaps one of the most inspirational speakers on the planet today, Les Brown was described as ‘mentally retarded’ in grade school. Was it this damning comment that’s made him the man he is today? Who knows, but it certainly spurred him onto great things. Check him out on his awesome YouTube channel, and you’ll soon see why this guy really does deserve his place on this list. Canfield has been described as America’s number 1 success coach – and he’s certainly got what you need from a motivational speaker. Loved by the business world, he also has words of wisdom for anyone who wants to up their motivation to achieve their goals in any field. There’s definitely an absence of females on this list, but Iyanla Vanzant truly deserves her place. Born and raised in Brooklyn, New York, Vanzant is also a TV host, lawyer, and a spiritual leader. She’s appeared several times with Oprah, both on her show and on her TV channel. Sometimes you just have to leave the best till last, and in our humble opinion, Oprah really is up there with the best motivational speakers of all time. She’s touched the lives of millions, both on her TV show, with live speeches, in her books, magazine articles, and on YouTube. She’s truly an inspiration, and proof that anyone – no matter how hard their start in life might be – can rise up and be as successful as they choose. You just need the motivation to work hard at it. Oprah really is the epitome of the American Dream.